A bucket list of the top sights at Lake McDonald, ordered by popularity. Lake McDonald is the largest lake in Glacier National Park. It is located at 48°35′N 113°55′W in Flathead County in the U.S. state of Montana. Lake McDonald is approximately 10 miles (16 km) long, and over a mile (1.6 km) wide and 472 feet (130 m) deep, filling a valley formed by a combination of erosion and glacial activity. 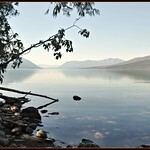 Lake McDonald lies at an elevation of 3,153 feet (960 m) and is on the west side of the Continental Divide. The Going-to-the-Sun Road parallels the lake along its southern shoreline. The surface area of the lake is 6,823 acres (27.6 km2). The lake is home to numerous native species of trout, and other game fish. Catchable species include, but are not limited to - westslope cutthroat trout, rainbow trout, bull trout (char), lake trout (char), Lake Superior whitefish, mountain whitefish, kokanee salmon (landlocked sockeye), and suckers. 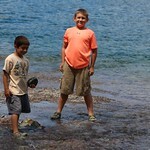 However, the lake is nutrient-poor and is not considered a prime fishing destination. Grizzly bears, black bear, moose, and mule deer are found in many places near the lake but are most common on the north shore. The lake is surrounded by a dense coniferous forest dominated by various species of spruce, fir, and larch. At the westernmost section of the lake in Apgar there is a National Park Service visitor center, limited lodging and dining facilities as well as outboard powerboats available for rental. Lake McDonald Lodge is the largest lodging facility on the lake and is approximately 5 miles (8 km) east along the Going-to-the-Sun Road. Constructed in 1913-14 to resemble a rustic hunting lodge with Swiss-influenced architecture, this warm and inviting building provides comfort for overnight guests. McDonald Creek flows into and drains from the lake, and empties into the Middle Fork Flathead River shortly after.